Terrific find by the good folks at Fan Blogs. Oregon is expected to unveil yet another helmet design in Thursday night's Las Vegas Bowl against Brigham Young. It appears only a shipping company can stop this from happening. Roughly half the players have received the new headgear and the team needs the full shipment to pull this off before it departs Monday from Eugene. 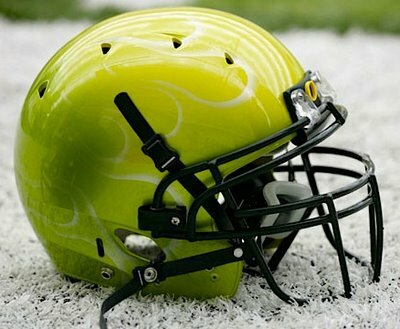 We will reserve judgment on the new design until we get a good look at it, but Fan Blogs has plenty to say: "According to reports, the new helmets will be paired with Oregon's notorious lightning yellow jerseys and lightning yellow pants, a combination that will be a significant setback to high-def tv sales nationwide." The photo is from Wayne Eastburn of the Eugene Register-Guard (some registration). Cheap Shot of the Year. For realz this time.